Combination Of The Afs-Tex System 5000 Anti-Fatigue Mat And S2s Polycarbonate Chairmat Offers The Ultimate Sit-And-Stand Ergonomic Solution. It Provides A Contoured Nonlinear Profile Of Between 4/5" And 2" To Facilitate Numerous Standing Positions That Significantly Reduce Fatigue. Raised Ergonomic Surround Feature Allows Further Rocking Or Stretching Of Feet And Ankles Which Can Help To Stimulate Blood Flow And Increase The Body'S Metabolism. Active Antimicrobial Ingredient Protects It From Microbial Deterioration And Will Not Wash Off Or Wear Away For 24/7 Effectiveness For The Life Of The Product. Ergonomic Polycarbonate Chairmat Provides The Perfect Easy-Glide Surface For Caster-Based Chairs To Reduce Strain On The Lower Body. Utilize The Afs-Tex 5000 On Top Of The Chairmat In Front Of Your Desktop While Standing. Use The Ergo-Bar Facility To Slide It Under Your Desk When Reverting To Sitting. Smooth-Back, 38" X 62" Chairmat Is For Use On Hard Floors.. Combination Of The Afs-Tex System 5000 Anti-Fatigue Mat And S2s Polycarbonate Chairmat Offers The Ultimate Sit-And-Stand Ergonomic Solution. It Provides A Contoured Nonlinear Profile Of Between 4/5" And 2" To Facilitate Numerous Standing Positions That Significantly Reduce Fatigue. Raised Ergonomic Surround Feature Allows Further Rocking Or Stretching Of Feet And Ankles Which Can Help To Stimulate Blood Flow And Increase The Body'S Metabolism. Active Antimicrobial Ingredient Protects It From Microbial Deterioration And Will Not Wash Off Or Wear Away For 24/7 Effectiveness For The Life Of The Product. 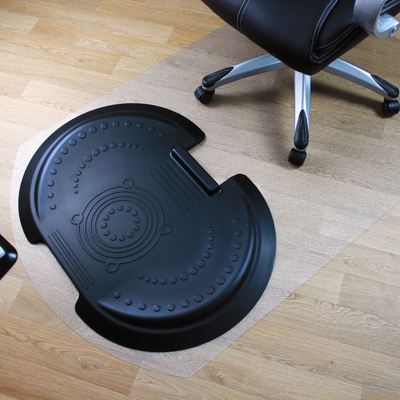 Ergonomic Polycarbonate Chairmat Provides The Perfect Easy-Glide Surface For Caster-Based Chairs To Reduce Strain On The Lower Body. Utilize The Afs-Tex 5000 On Top Of The Chairmat In Front Of Your Desktop While Standing. Use The Ergo-Bar Facility To Slide It Under Your Desk When Reverting To Sitting. Smooth-Back, 38" X 62" Chairmat Is For Use On Hard Floors.